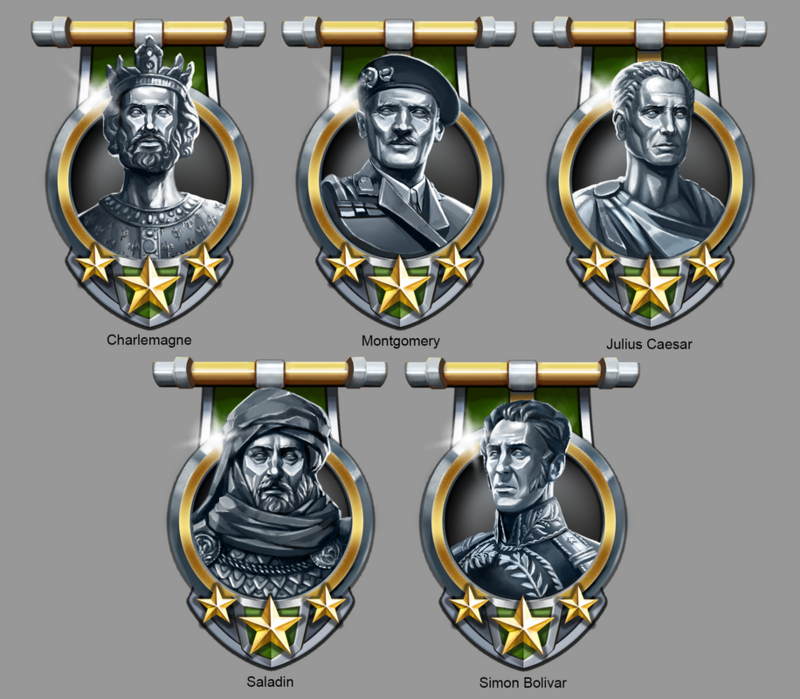 Throughout eRepublik history more than once astute military decisions and the ability of leaders to inspire armies brought victories to underdogs. Soldiers who fought alongside allies and forged friendships on the battlefield gained the admiration of their peers and the respect of their enemies. We are happy to celebrate such deeds of valor with a new event: “League of Allies,” rewarding soldiers who go above the call of duty for their allies. In an attempt to even out the odds, we are also changing the way Mutual Protection Pacts work, adding an element of strategy to compensate raw numbers. During the five days of the event, fighting for allies will enable every player to win gold and friends. The event starts on day 3,583 at 00:00 and end day 3,587 at 23:59:59. Players are grouped in 5 leagues, each named after a famous general. The distribution is based on the military activity during the last month. Players will gather event points by using energy while fighting for their allies. Fighting in both direct battles and resistance wars involving your allies will count for this event. Look for the event icon on the wars list or on the battlefield when picking a valid battle which will bring you points. Each day, 4 different Gold rewards are available; they can be unlocked by gathering event points.These are awarded when fighting for your allies in valid battles. 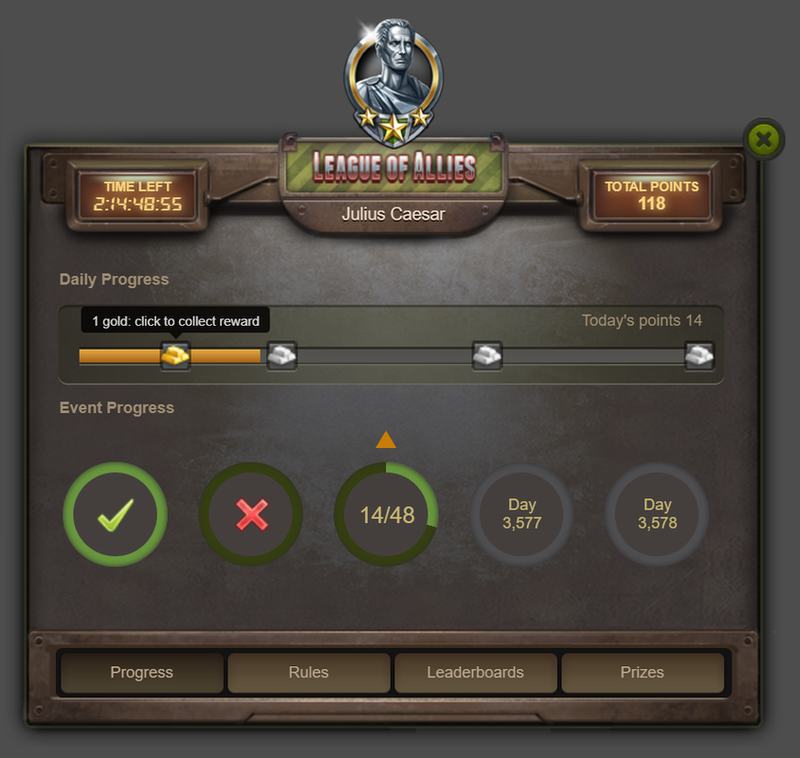 Each league will have its own requirements and rewards. The number of energy required for one event point is dependent on the league the player is in. I.e. a Julius Caesar league player gets 1 point after each 50 energy used in a battle for a side his country has an MPP with. If the player has a partial point at the end of the round, the point is not awarded. The energy for the partial point used IS NOT carried over to the following round or to another battle (round) or division. As mentioned above, 4 Gold prizes are available to unlock every day by gathering the points required to complete the milestones. Unlocked prizes need to be claimed by the end of the day. The players completing all the milestones will receive a decoration based on their league, with the effigy of the general who gives the name of the league. The top performing players in each league will be rewarded with gold based on their placement in the top 100 ranks of the event (based on the total points gathered throughout the event). Is the new Deploying Allied Forces mechanic a permanent change or will it be reverted after the event? Edited by eclank, 05 September 2017 - 01:31 PM. Oh this is gonna be fun. how will you avoid bigger countries not selecting smaller countries ie nullifying the already expensive MPP they paid for? Another event aimed only at folks that buy packs. Does the mechanic apply even when one of the countries involved is wiped or/and for RW? I don't care for the event, Panem et circenses. That MPP thing looks hella interesting, I'm gonna need to ponder on that a bit. (and by extension, if the CP/Dictator can chose countries who are not in its MPP list to the deployment board). If the deployments can be change anytime and those are the active MPPs, then MPPs are just useless except for the CP/Dictator to be connected quite sometime (+ while in most of countries, MoD is the actual war leader/strategist). Edit: I would add, that if it's the case, it would destroy all the alliance and strategy thing. I purposed a while ago, that we should be able to fight only for its alliance country and to add an option to retire (when we want to lose a region) with a cool-down delay ; but it'll need more reflection on how to manage unaligned countries, defensive and RW wars, and enlist countries mercenaries rather than global CO.
Edited by Maliopopoubross, 05 September 2017 - 03:35 PM. Could you post an overview of requirements and rewards per league? I'm rather sure they differ and we can't switch to another yet it's interesting to know. I think a "military leader" can only pick nations from their MPP list, as in from those voted through congresses. Otherwise it really wouldn't make sense. Edited by TheJuliusCaesar, 05 September 2017 - 03:54 PM. so it would be above MPPs. but as you can change them all the time, except in case of global war it's not really useful (except to force people to be connected). Plus it would rather penalize smaller countries (to get priority other bigger ones ; and add competition btwn them) while I think it was aimed to be the opposite (i.e. to counter rather long mpp lists). I misread about the 'military leader', yet I would prefer the CP/Dictator to chose a bunch of people (a kind of 'MoD team'). Basically weakens Asteria, for the moment. Nothing Serbia can't manage. Still it's nice to see some form of strategy added back to the game, however small. War strategy is usually a group of people that know what's up. Not a person positioned somewhere for a month. Unless it's a country that can only do TW or be wiped. It won't destroy alliances. There is something called time zone advantage. Can you fight for MPP in the wars of resistance? Will the possibility of fighting continue to be determined by the country in which the player is located? It would be interesting to think about changing the latter and that is determined by the citizens. It would disenfranchise citizenships contrary to the alliance of which they are part and would diminish the harm suffered by players in erased countries that must travel always to fight for allies. "The players completing all the milestones will receive a decoration based on their league, with the effigy of the general who gives the name of the league"
Does this mean that a player needs to collect all milestones each day ? For Montgomery league that would mean 16,000 energy each and every day. Can someone please clarify this ? Edited by TheKralj, 05 September 2017 - 05:10 PM. Not really a life changer this update, regarding MPPs and alliances. Unless they don't plan to raise travels cost or to make travel only available by tickets (thus creating a new tickets' factory). 1/ I thought you wouldn't need MPP to choose deployment. That explain why I said that. It's sad that you can't call your whole allies to fight for you directly, which is the essence of an alliance. on the other hand it wouldn't allow an ally to fight easily for you on its good will. As for strategy, as a fighting mechanism (not as people drawing plans), I think it'll be insufficient. If you consider deployment as a time needed to deploy troops ; being able to change each round is kind of fast ; and if troops are "deployed" somewhere, how can they fight on the whole globe and also home ?